Dr A.V. Koshy is an Indian author presently living in Saudi Arabia and teaching English language and literature at the University level. He has authored six books of which three are on literary criticism, including A Treatise on Poetry for Beginners and three are collections of poetry including Figs. 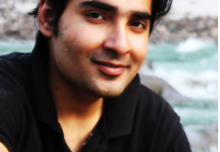 He is also an editor, having edited books like Inklinks and for Lifi and writes fiction though, without doubt, his most fascinating work is his poetry and posts and criticism on facebook despite the fact that its pattern has not been fully understood, yet. He hopes to bring out more books in the future, including a collection of short stories and an anthology edited by him and Reena Prasad. 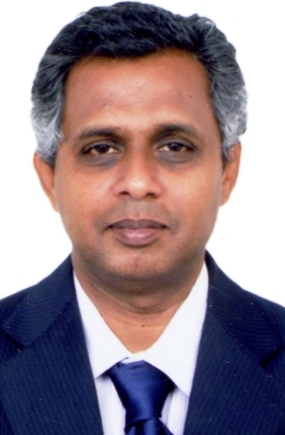 Nalini: Dr. Koshy, I am an avid reader of your poetry and criticism. I follow your writings on Facebook because they are fun and thought provoking. I am very happy that you could take time out to talk to me about poetry, literature and life beyond it. You have this remarkable ability to balance levity with gravity. In your poems, profound ideas and observations are conveyed in a lighthearted and deft manner. In the practice of writing, of poem-making – can you say something about your relationship with poesies, language and imagination? Dr. Koshy: Nalini, I am very happy to engage with you in this dialogue. It is especially a pleasure to talk to someone who actually reads your work. I have read yours, too. The truth is I am a classicist in my criticism but a romanticist in the way I write poetry. To be precise, my poetry is a spontaneous overflow of emotion, reworked then in tranquility. Not a studied exercise. This does not mean it lacks rigor. Earlier I wrote using various poetic forms but knowing the history of poetry I find my matter does not contain itself satisfactorily in these forms and so prefer free flow. I am mainly influenced by English poetry and poesies, not so much by poesies, but am a big fan of proper use of language, meaning. Even experimentalism has to be apt or done by someone who knows what he or she is doing. As for the imagination I would be so bold as to say poetry IS imagination. Why do you write? Recently you completed 10,000 poems and have written more. What keeps your pen flowing? I write because I have so much to say and I feel I have not even scratched the surface of what I want to say and in the quest I also picked up not only forms but genres though ultimately I seem to be mainly a poet and critic and editor, as of now. Others think the critic in me better, maybe, but I do not. I think I am good at all three. When I write fiction it becomes sheer poetry or poetic and even dialogue I write for drama becomes poetic. I also love narrative verse, epic poetry etc. My love for writing, my lust for it, my passion for it, my being full of life and thoughts and ideas keeps my pen flowing. The greatest inspiration is love and art in that order. I write better, or so I feel, when inspired by love or art. My own writing is largely cathartic and at this point I would like to mention your poetry group Rejected Stuff which is one of my favorite places as it offers complete creative freedom and nurturing to the members. Contrary to its name, the group has some of the finest poetic voices. Why call it Rejected Stuff then? What is your vision for the group? Writing, according to me, is always cathartic. My writing borders obsessively on sadness and my biggest accolade has probably been the amazing number of people responding to my writing by saying it made them weep. However, I agree one has to move beyond that and I hope I have. Another accusation has been that your writing is too personal. I do not know if all this is detrimental, to be personal, to be sad, to be despairing, to be melancholic, to be depressed, to be angry – but this lead me on to get a number of rejections. The rejections I faced were content based and not ones saying my writing was not up to the mark. This made me think of starting a group where writers who wrote well but were still getting rejection slips could come together to help each other out by posting freely, sharing in their joys and sorrows, meaning acceptances and rejections, help each other out etc. The group was hence named simply Rejected Stuff. It practices very little rejection or censorship as you noticed and many fine and even great poets, award winning ones now post there as do beginners and all other kinds or sorts of writers. We have instituted a prize, an international one called the Reuel Prize, and the first one was given to Dr Santosh Bakaya for a long poem called Oh Hark, and as the contributions to the group are exemplary and numerous and encouraging we decided to bring out our own anthology titled, The Significant Anthology. We means Reena Prasad and I and we are now in the process of editing and publishing the same. It will have 175 pieces of prose, fiction and poetry by writers from all over the world. It is going to be a landmark of an anthology. You have a long and impressive list of international publications despite, as you say, many rejections. Reaction of the readers is, I feel, greatest motivating factor- when someone says your writing made them cry, or that your poem spoke to them, you know you are on the right path. However, rejection letter is something no writer can ever get used to. Did you ever consider giving up? For three years I published non-stop at a grueling pace, books and articles and poems at the rate of almost one a day, despite the rejections, as you said. The rejections hurt as they were asking me to write what they wanted or what others wanted to or what the world wanted, it was all about political correctness and my being too radical. It happened even on Facebook. I have never considered stopping writing but have considered not putting it on Facebook and have given up presently on publication due to many reasons like not being given copies, being made to buy though a contributor, not being informed, not being paid etc. but as to giving up, no. I have fought by simply making an alternative where I can be more or less free to do what I like – write what I want. And it is working, people still read me and as I said the group is a success. Publication can come again and will later. You are perhaps the most prolific poet/writer I have known and on certain days poems just roll off your fingers. They are rich in imagery and startling in their content, quite peerless I can say without exaggerating. Your voice is not only reaching out but also welcomed by readers all over the world. Your book of essays on contemporary India in collaboration with Dr. Bina Biswas, “Wake Up India” was showcased in Frankfurt Book Fair last year. Yes, slowly but surely my ability to be prolific is getting me a steady readership. And there have been big successes on the way like the one you just mentioned regarding Bina’s and my book being featured along with other books – I mean Wake Up, India and also my nominations for Pushcart Poetry Prize in 2012 and other awards. There have also been other successes in the fields of editing and writing. How do you perceive the role of internet and social media towards well-being of the poetry/ writing? Well, plainly speaking, I am purely a product of social media in the sense that I cut my writing spurs in terms of getting a readership in social media, learning how to do it in places like the now extinct journalspace. I never knew anything about getting published but knew almost everything about writing and the net gave me instant access to an audience that wanted only one thing, good writing. 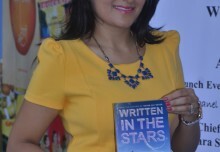 I became famous on journalspace and on Urgent Evoke but exploded on facebook where two of my books were literally written first on it and got such massive positive responses that I have never looked back. The books so written were A Treatise on Poetry for Beginners and my part of Wake Up, India. My poetry too became famous thus. Due to walls, pages, groups etc., facebook and google plus has made many new poets come up and become recognized for their powerful poetry. The role thus of the internet and social media in encouraging poetry and writing is huge and has swamped or will swamp traditional media entirely soon and I for one am happy about it. Writing, according to me, is always cathartic. My writing borders obsessively on sadness and my biggest accolade has probably been the amazing number of people responding to my writing by saying it made them weep. However, I agree one has to move beyond that, and I hope I have. Social media tends to bring people from all over the world together on a common platform. Ideally it should open minds and hearts and bring wider acceptance of diverse opinions and views. What does your experience says about level of tolerance with regard to the creative freedom. How free is an artist in today’s world to express himself? Social media does not make us free, contrary to what most people think. Same is true for publishers who are unlikely to give writers a free hand. However, social media does us a lot of good in terms of exposure and many other things. Unfortunately, it also leads to rivalry, jealousy, and being misread and misunderstood. After all, it is meant primarily for networking. The readers one finds there are not ones who would buy your work because they want to but read it as it is freely available. this can lead to many positive gains like cutting through the middlemen but also to heavy losses like that of being considered autobiographical when one is being imaginative etc. Tolerance levels are not really very high on social media, lines are quickly drawn and we are told what is possible and what is not through interference such as reporting on fb, for instance by anonymous people. Which poets or writers influenced you/ your writing? What books/projects have you been working on presently? Some of my projects got shelved somehow but I am working on some new ones like a long poem, the anthology I told you of and trying to write a long story or a novel, plus a small book on Nobel Prize winners. My influences are too many and all of them show through but invariably more and more I think my voice is my own and no one else’s. Unlike others I am too wide-ranging a writer to be boxed in and too restless, innovative, experimental and original to say I am influenced but I guess when it comes down to it, the Bible and Beckett mattered to me a lot, the latter in my very consciously trying to not write like him, except in not using punctuation in my poems. What advice do you have for upcoming writers and poetry lovers? Dr. Koshy – Poetry lovers need not be biased in preferring only validated stuff and upcoming poets really need to be more objective about refining their work if they want international and long lasting recognition. We see a lot of diamonds but mostly in the rough and I think this is where social media harms people in that you get instant recognition and adulation which makes you a producer of much rather than a perfectionist. That’s the main thing I have to warn against, I guess. It affects me too. 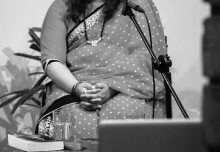 Nalini Priyadarshni is a poet, writer, editor and amateur photographer. 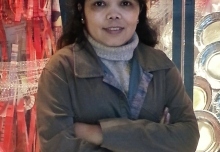 Her work has appeared at numerous magazines and international anthologies including Up the Staircase Weekly, eFiction India, Mad Swirl, Camel Saloon, Earl of Plaid and Quail Bell. She lives in Ludhiana, India with her husband and two feisty kids.